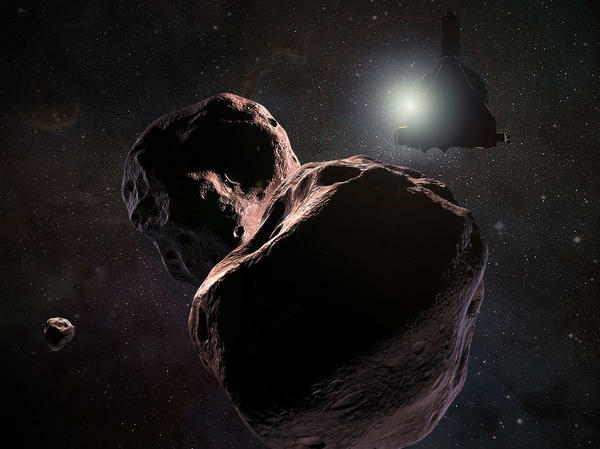 An artist's impression of NASA's New Horizons spacecraft encountering Ultima Thule, a Kuiper Belt object that orbits 1 billion miles (1.6 billion kilometers) beyond Pluto, on Jan. 1, 2019. NASA's New Horizons mission flew past Pluto on July 14, 2015, revealing a world with ice mountains and an atmosphere. Four images were combined with color data to create this enhanced color global view of Pluto. "Really, we have no idea what to expect," Alan Stern, principal investigator of NASA's New Horizons mission, said during a recent news conference. The New Horizons probe is about the size of a grand piano. It has been flying through space for more than a dozen years. In 2015, it reached Pluto, and what had long been just a fuzzy circle in photographs was revealed to be a stunning, dark-reddish world made of frozen nitrogen and methane, with ice mountains. "The exploration of Pluto that we conducted was scientifically spectacular," Stern said. After speeding past Pluto, this mission always planned to visit another icy world, given that it was flying through a region of the solar system called the Kuiper belt that's littered with thousands of small, icy bodies. But it was tricky to find a minor planet that was reachable with the spacecraft's remaining fuel. Then, a few years ago, the Hubble Space Telescope spotted one. Researchers know enough about this tiny world's orbit to be able to intercept it, Stern said, "but there's very little else we know." Its official name is a bunch of numbers, 485968, so it goes by the Latin nickname Ultima Thule, which means "beyond the known world." By watching it pass directly in front of stars, researchers figured out that it can't be spherical — it seems oblong. "It's also red in color, we know that. The surface is even redder than the surface of Pluto," says Anne Verbiscer, a planetary scientist at the University of Virginia. This world is 44 times farther from the sun than Earth is, she says, and it has been out there since the solar system formed over 4 billion years ago. "So the sun has not heated it up at all and modified its surface," Verbiscer points out. "It's been essentially unchanged." That makes it a potentially revealing relic from the solar system's early days. "Seeing what the surface is going to look like up close is just going to be amazing!" Verbiscer says. It takes about six hours for the New Horizons data to get all the way back to Earth, and researchers expect that detailed images from the spacecraft's close flyby will be unveiled to the public on Jan. 2. To reach the latest news about our solar system, you have to travel out to Pluto, really far from the sun. And then you travel about a billion miles more. That's what a spacecraft has done. And now it's about to get a look at a mysterious object known as a minor planet, one of thousands in the outer reaches of the solar system. The craft passes by just after midnight on New Year's. That's just after midnight Eastern time on Earth. NPR's Nell Greenfieldboyce reports. 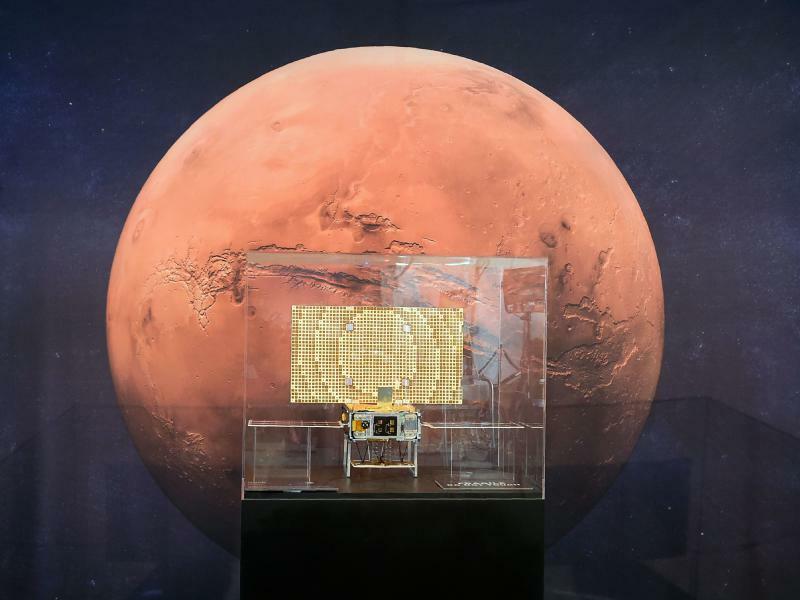 NELL GREENFIELDBOYCE, BYLINE: The New Horizons probe is about the size of a grand piano. It's been flying through space for over a dozen years. In 2015, it reached Pluto. What had long been just a fuzzy circle in photographs was revealed to be a stunning, dark reddish world made of frozen nitrogen and methane with ice mountains. ALAN STERN: The exploration of Pluto that we conducted was scientifically spectacular. GREENFIELDBOYCE: Alan Stern is the principal investigator of NASA's New Horizons mission. This mission always planned to visit another icy world after speeding past Pluto. After all, it lies in a region of the solar system that's littered with thousands of small, icy bodies. Stern says this upcoming flyby will be the most far-off exploration of a world that's ever been attempted. STERN: Really, we have no idea what to expect. GREENFIELDBOYCE: It was tricky to find a minor planet that was reachable with the spacecraft's remaining fuel. But a few years ago, the Hubble Space Telescope spotted one. 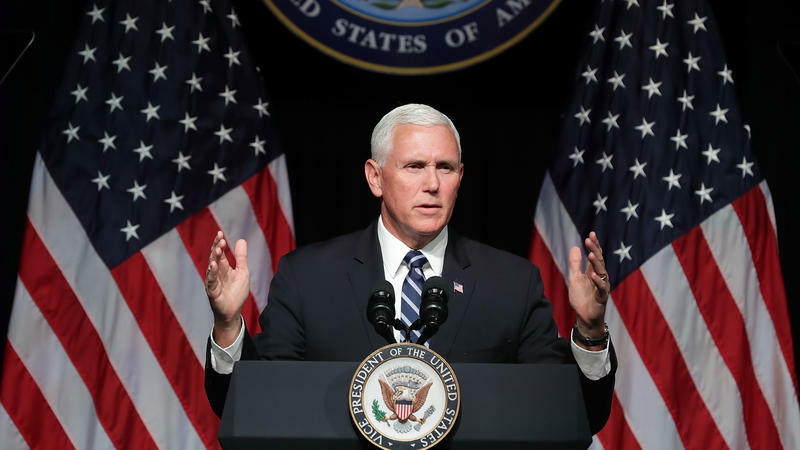 At a recent press conference, Stern explained that researchers know enough about this tiny world's orbit to be able to intercept it. STERN: But there's very little else we know. GREENFIELDBOYCE: Its official name is a bunch of numbers, so it goes by the Latin nickname Ultima Thule, which means beyond the known world. This object is pretty small, only about 20 miles across. Anne Verbiscer is a planetary scientist at the University of Virginia. She says by watching it pass directly in front of stars, researchers figured out that it can't be spherical. It seems oblong. ANNE VERBISCER: It's also red in color. 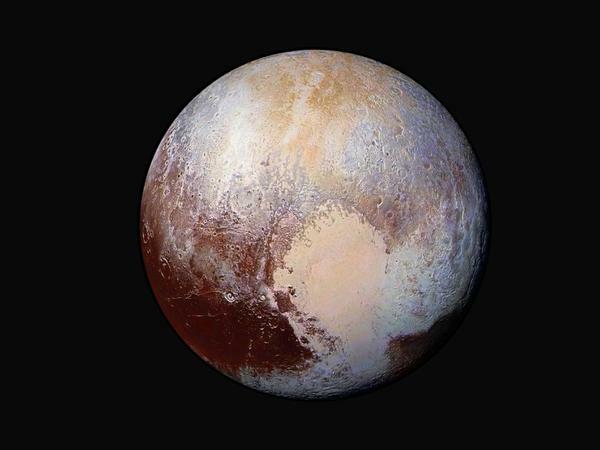 We know that, that the surface is even redder than the surface of Pluto. GREENFIELDBOYCE: Verbiscer points out that this world is 44 times farther from the sun than the Earth is. And it's been out there since the solar system formed over 4 billion years ago. VERBISCER: So the sun has not heated it up at all and modified its surface. It's been, essentially, unchanged. GREENFIELDBOYCE: That makes it a revealing relic of the solar system's early days. The New Horizons probe will fly by around 2,200 miles from its surface, snapping images with an onboard telescope and camera. VERBISCER: Seeing what the surface is going to look like up close is just going to be (laughter) amazing. GREENFIELDBOYCE: It takes about six hours for the spacecraft's data to get all the way back to Earth. Detailed images from the close flyby are expected to be unveiled on January 2. Nell Greenfieldboyce, NPR News. (SOUNDBITE OF ZEN ONGAKU'S "TO THE MOON") Transcript provided by NPR, Copyright NPR.